Tonight's review is a pre-production sample of a new cigar in the Liga Privada Unico Serie line from Drew Estate -- the Ratzilla. 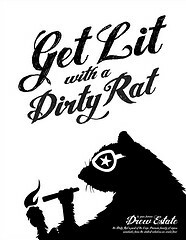 Last year, Drew Estate released the Dirty Rat which became an instant favorite on many blogs (including mine.) 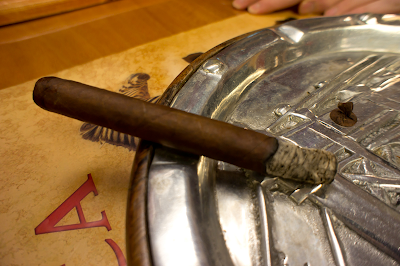 The Ratzilla is the same blend of tobaccos as the Dirty Rat, just in a much larger size. Can you say yummy? Rumor has it that this stick is officially going to be released at this year's IPCPR show, but after spending some time with Steve Saka (president of Drew Estate), I know how personally he takes Liga Privada and these cigars will not be released until they are "ready" by his standards. 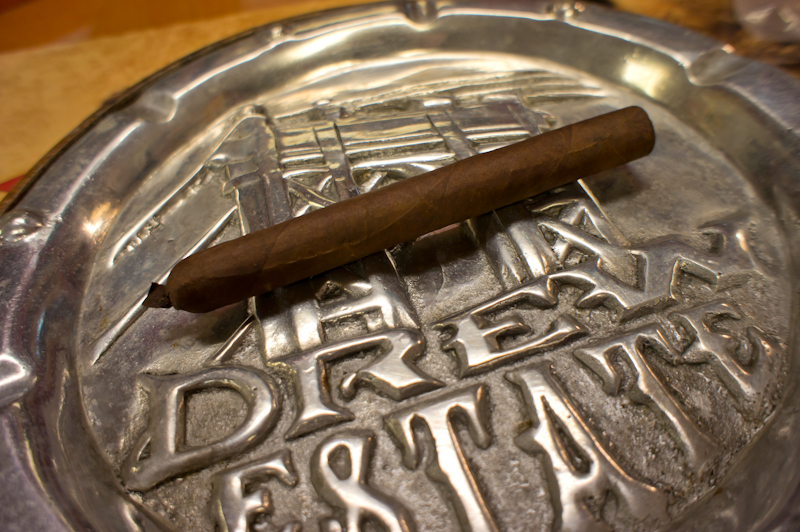 A little about this sample: This past January, I was invited to go the Drew Estate Cigar Safari with my partners at Cigar Explorer. We spent 3 days touring factories, trying many new cigars, and even blending two batches of our own sticks. This was an absolutely amazing trip and I am very thankful to the entire Drew Estate crew for making this a reality for me and my partners. 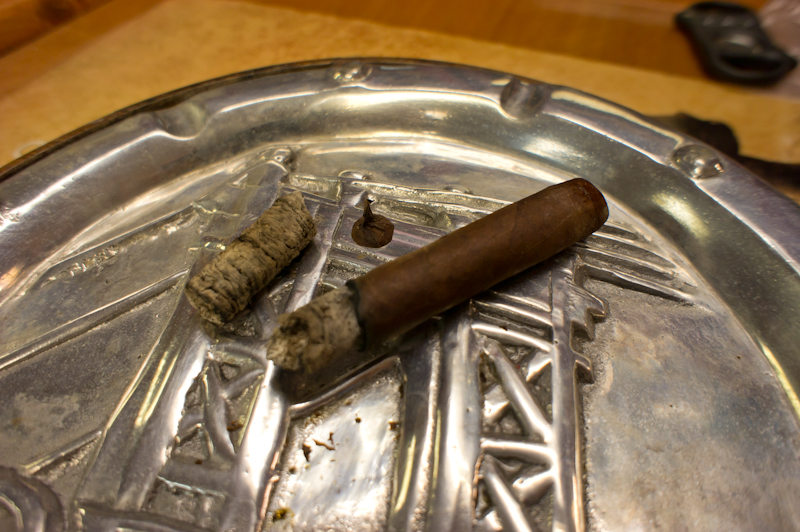 This particular sample of the Ratzilla up for review was taken right off of the rolling table by Pedro Gomez (Drew Estate International Sales and Cigar Safari Guide) and handed to me while on the tour. I watched the woman roll this stick with my own eyes, so to say that it might be a little young might be a huge understatement. The stick has spent three weeks resting in my cooler and I can't wait any longer to fire it up. After a few weeks' rest, my first inspection of the pre-production sample of the Ratzilla, had me thinking it still was a bit "wet". The tobacco was a little spongy and soft, but firm enough that I thought it would smoke. Like I said above, I had only waited three weeks, as my temptation had the better of me. The stick did have some weight in my hand and felt evenly packed from head to foot. The wrapper was very toothy, with a few larger veins, but when rolling the stick the palm of my hand, it felt very smooth. 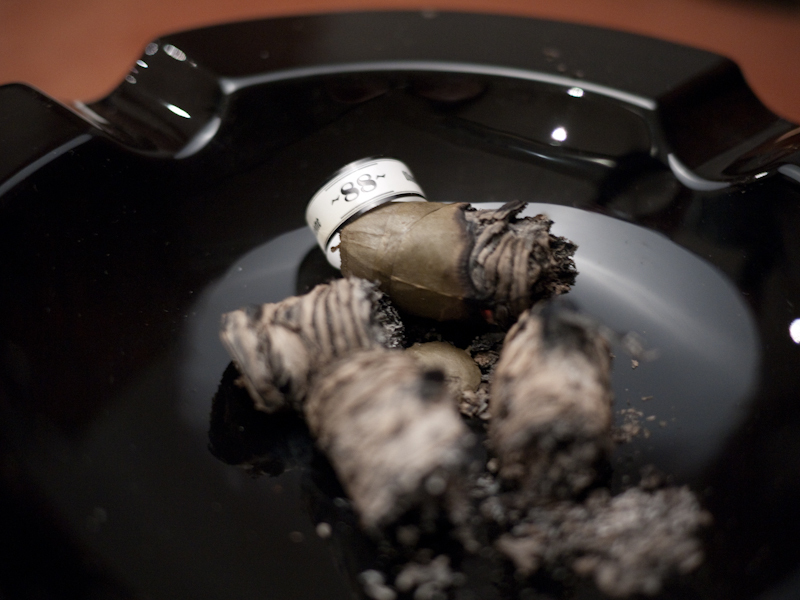 The cigar did not give off much of an aroma and the cold draw had a faint natural tobacco taste mixed with some spice. I lit my Ratzilla with a triple flame torch and was immediately hit with what I was expecting. Delicious black peppery spice was blasted my taste buds. I am a big fan of this flavor (it's what I like so much about the Dirty Rat), so I was hoping for it. The first inch or so of the stick continued to produce a strong black pepper flavor, but after getting past that start the flavor started to mellow. 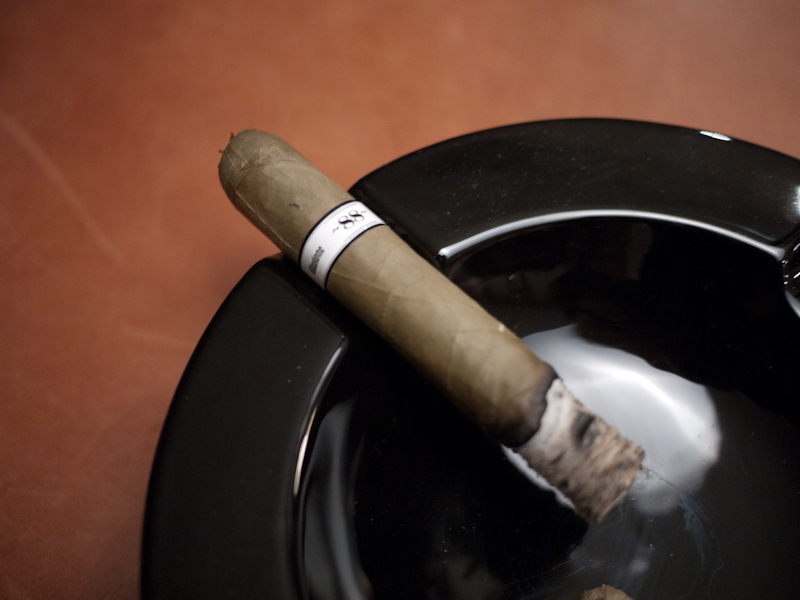 The cigar was now producing a milder black pepper on the front, mixed with some earthy sweetness on the finish. The construction of the stick is well worth mentioning because the draw was perfect, the burn was perfect, and the volume of smoke was enjoyable. Unlike the Dirty Rat, the body at this point was more in the medium range and not full-on nicotine buzzing. In the second third of my Ratzilla, the pepper flavor really mellowed off, almost to non-existent. Actually, I would say the flavor was completely gone, but the feeling of the tingle on my tongue I got from the black pepper spice was still there. On the front of the flavor profile, I then picked up a mild, yet very distinct cedar taste. What I found most interesting about that taste is that this particular stick has never seen the inside of a cedar box. This cigar was literally taken off the rolling table, put into my travel humi, and moved straight into my cooler, yet the cedar was definitely the flavor I tasted. Along with the cedar on the front, I started to get some bitter chocolate notes on the finish. This too was a pretty mild taste, but very obvious and easy to pick out of the smoke. Again, the construction was top notch with zero issue keeping the cigar drawing well and burning evenly. The final third of my Ratzilla is where I think the cigar being young/fresh might have shown up. The flavors were still there from the second third: cedar on the front and bitter chocolate on the finish. However, the power of the flavors had diminished even more from the mild range into the almost-not-there range. I want to say certainly that it was not flavorless, just extremely mild at this point. In complete contrast to that, the body of the stick was now well into the full range and I could feel my heartbeat kicking up a few notches. 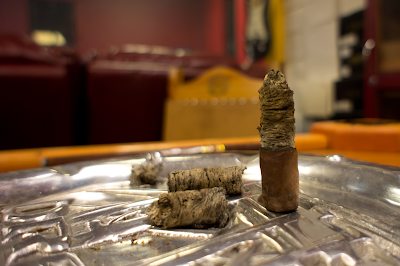 Another change that seemed to happen in the final third is the smoke volume picked up even more than the first two portions of the cigar. I was getting plenty of smoke from the get go, but now I was getting really thick, full clouds. 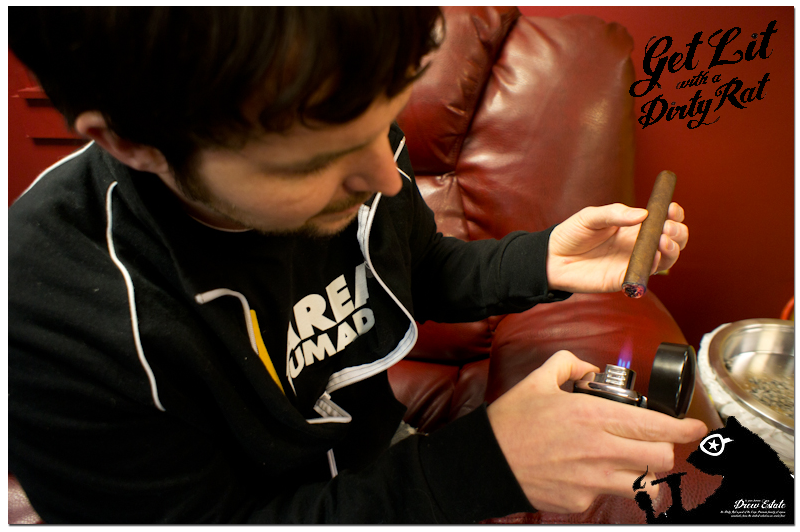 As you can see from the pictures, I had no problem nubbing the cigar, and the stick never got hot or sour. My final thoughts on the pre-production Liga Privada Ratzilla? It's not fair at all to judge a cigar overall on a sample that is so fresh, or maybe even on just smoking one of them (that's always debated.) Like I always tell people who ask me about this blog and reviewing: I am reviewing the one stick I am smoking, not the entire brand/line. With that said, I feel like my Ratzilla sample is/was a sleeping monster. The flavors are all there and that pepper at the beginning is ready to jump up and bite you. In my opinion, the blend is ready and dead on. The cigars just need some time to fully mature. I think that would help prevent the flavor strength from dwindling like it did for me in the final third. This monster will wake up and it will be another instant favorite to many cigar smokers. Would I buy it again? I have no idea how much this cigar is going to cost, but I am sure I will be buying more of them when they are on the shelf and in full production. Would I buy a box? If it's anything like the Dirty Rat price, this is more than likely going to be out of my budget range for box purchases. But, if I fell into a lot of extra cash, this is a cigar that would be high on my box-buying list. Great blog! 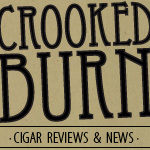 Just added you to my list on cigarcatadore.blogspot.com. I discovered you tonight and really like your work.